Today the Mannheim Regional Court announced its ruling on a German Nokia lawsuit against HTC over EP1579613 on a "method and apparatus for enabling a mobile station to adapt its revision level based on network protocol revision level". The court, which has adjudged more wireless patent infringement claims than any other forum in the world, found HTC to infringe this Nokia patent, held it liable for damages (the amount of which would have to be determined in a separate proceeding), and ordered an injunction (a remedy at law for patent infringement in Germany). The patents is somewhat standards-related (it plays a role in backward compatibility between new devices and networks running older technologies), but not standard-essential. HTC already has a license to Nokia's standard-essential patents (SEPs), but still needs one to Nokia's non-SEPs. This is the fourth German patent injunction Nokia has obtained against HTC to date (and various cases are still pending, particularly before the Dusseldorf Regional Court). Nokia previously won a different case in Mannheim (in March 2013) and two Munich cases (both in December 2013; 1, 2). I did not report on the trial, which took place on January 14, but I mentioned the filing of the the lawsuit adjudicated today in an April 2013 post. "Nokia is pleased that the Regional Court in Mannheim, Germany has today ruled that HTC products infringe Nokia's patent EP 1 579 613 B1, which enables modern mobile devices to work in older networks. This judgment enables Nokia to enforce an injunction against the import and sale of all infringing HTC products in Germany, as well as to obtain damages for past infringement. This is the fourth patent found infringed with injunction awarded in Germany. Nokia began its actions against HTC in 2012, with the aim of ending HTC's unauthorised use of Nokia's proprietary innovations and has asserted more than 50 patents against HTC. Since then, Nokia believes it has demonstrated beyond doubt the extent to which HTC has been free riding on Nokia technologies, with HTC found to infringe several Nokia patents in venues including the Regional Courts in Mannheim and Munich, Germany, the UK High Court, the Tokyo District Court in Japan and the US International Trade Commission." Bird & Bird's Oliver Jan Juengst ("Jüngst" in German) was Nokia's lead counsel in this action. Cohausz & Florack's Philipe Walter was the lead patent attorney in these infringement proceedings as well as the case Nokia won on December 30, 2013. Nokia is primarily targeting HTC's Android-based devices. Some hardware patents are asserted against all HTC devices regardless of platform, but the focus is on Android. After this week's announcement of Google's sale of its Motorola Mobility hardware business to Lenovo, different commentators have expressed opinions on whether Google's purchase of Motorola's patents contributed to patent peace. I've been on the skeptical side, from the day in the summer of 2011 that the deal was announced. There appears to be some spin-doctoring going on that misleads reporters who don't follow these major global disputes in every detail. For example, a news agency article published today states that "[n]o new lawsuits have been filed by competitors against makers of Android phones since Google's purchase of Motorola Mobility". I could give a whole list of examples that prove the opposite, and additional reasons for why this, even if it were true (in reality, it's totally false), would fail to prove that the Motorola deal had much of an effect, if any, while there are strong indications that it was the opposite of a game changer. I may elaborate on this with further facts on Monday (after this eventful week I've postponed my plans for an extended break). The lawsuit Nokia won today in Mannheim is one example that is sufficient, all by itself, to disprove the claim. This lawsuit was filed in April 2013, i.e., 11 months after the formal closing of the Motorola Mobility deal, by Nokia, undoubtedly a competitor. Whoever propagates (it doesn't matter whether or not this is done by Google or on Google's behalf or -- which would be most embarrassing -- by incompetent "analysts" and "pundits") that no competitor dared file lawsuits against Android-based devices after the Google-Motorola deal is already proven wrong. Again, I can give various other examples of such lawsuits that were filed after Google acquired Motorola's patents, even if one bases this on the formal closing of the deal and not on the date of the August 2011 merger agreement. Many of those lawsuits were filed by Nokia. It filed its first round of lawsuits against HTC (and, in parallel, ViewSonic, a lower-priority target) in late April and early May 2012, at a time when the Motorola deal had been cleared everywhere except in China. The first Nokia v. HTC filings were made in the U.S. and Germany. Nokia kept filing more lawsuits in those jurisdictions (for example, a federal lawsuit in Southern California and a second ITC complaint, both in May 2013, i.e., about a year after the formal closing of Google's Motorola deal) and brought assertions in five other jurisdictions. Yes, in five of the seven countries in which Nokia is suing HTC over its Android-based devices, the first filings occurred well after the formal closing of the Google-Motorola deal. Late on Wednesday, Google CEO Larry Page announced the signing of an agreement to sell Motorola [Mobility] to Lenovo for $2.91 billion". He says "Google will retain the vast majority of Motorola's patents, which we will continue to use to defend the entire Android ecosystem", claiming in the same blog post that "Motorola's patents have helped create a level playing field, which is good news for all Android's users and partners". Since Mr. Page became the successor of his own successor (Eric Schmidt), Google has been extremely successful (I'm talking about the business, not its patent lawsuits), making him the second-most successful returning CEO in this industry (unlike Steve Jobs, he didn't have to manage a complete turnaround here). But there are basically two things for which investors criticized him according to various reports I read over the last few years. One, the impact of Motorola Mobility's (loss-making, I believe) hardware business on Google's margins. Two, Google's investment in "moonshots" in many fields, from anti-aging to robots to self-driving cars. I can see why some investors would like a more traditional, margin-oriented, quarter-by-quarter approach -- that's the way Wall Street works, though I'm a big fan of Google's innovative efforts in those new fields. For example, Google's investment in self-driving cars has accelerated the automotive industry's efforts in that field, and getting rid of accidents and saving people time spent unproductively and inconveniently behind steering wheels will one day -- when no one will die from road accidents anymore -- be regarded as one of the most important technological achievements of mankind, possibly more important than the literal moonshot. So I'm really glad that Mr. Page jettisoned the former (Motorola Mobility's hardware business), not the latter (those new business areas that have the potential to make the world a better place). I disagree with his portrayal of the impact of Motorola Mobility's patents. With zero injunctions in force worldwide against Apple and Microsoft (or anyone else), the Motorola Mobility deal has not been able to bring about patent peace. On the contrary, its aggressive assertions of FRAND-pledged standard-essential patents (SEPs) have contributed to a problem that antitrust regulators have solved to only a limited extent so far. I remember an anti-software-patent activist in Europe, a former president of an anti-patent NGO, saying that "the problem has to become a whole lot bigger before we can solve it". I'll give Google the benefit of the doubt that this could have been the idea to some extent. But even if that was the intent, it doesn't mean the Motorola deal was or will be a solution. Mr. Page's announcement that Google "will continue to use [Motorola's patents] to defend the entire Android ecosystem" means that patent assertions against Apple and Microsoft are not going to be withdrawn after the closing of the deal, which, as Mr. Page notes, will take time due to the need for regulatory clearance. So what are the implications for pending Apple-Motorola and Microsoft-Motorola litigations? I don't know if Lenovo has an Android patent license deal in place with Microsoft, or will work with an Original Device Manufacturer who has a license. On the PC side Lenovo is certainly a Microsoft partner. Should Lenovo, directly or indirectly, pay Microsoft patent royalties on Motorola Mobility's Android-based devices, then Microsoft has already won in the sense that Google would have been unable to prevent Motorola Mobility from doing what I believe it would already have done (like 20 other companies) if not for Google's wider agenda. I doubt that Lenovo has a deal in place with Apple. It's another question whether Lenovo is a priority target for Apple to sue. Depending on how the deal is structured, it could be that Google wouldn't be affected in any way by any further patent enforcement against Motorola Mobility -- Lenovo may have agreed to handle the related risk. In that event, Apple might settle the offensive part of its case just like it did with HTC, which also became a low-priority target at some point. If Google keeps suing Apple and Microsoft over Motorola's patents (which is what it will do according to the announcement) unless they give Google a global Android patent license that covers its hardware partners (how else could Google "defend the entire Android ecosystem"? ), which they probably won't, then Apple and Microsoft could still countersue Google over (i) the Android software and (ii) any Nexus devices it sells. So far, Apple and Microsoft haven't done any of that, but a company they own jointly with three other industry players, the Rockstar Consortium, recently added Google as a defendant to a Samsung lawsuit. In the United States (and other jurisdictions, such as the UK), operating companies suing competitors over patents they implement in their own products are in a far better position to obtain injunctions (including ITC import bans) than those who don't. In U.S. federal court, it's not impossible but certainly rather difficult to satisfy the eBay v. MercExchange criteria as a non-practicing entity. The ITC's domestic industry requirement is almost a joke by now because even patent trolls frequently satisfy it, but the Obama Administration plans to raise the bar for this as well (see "Legislative Recommendations", item 7). By publishing the Android software, Google doesn't practice wireless patents such as Motorola's 3G and 4G SEPs. Google will probably try to leverage its involvement with, and distribution of, the Nexus devices in this context. Motorola Mobility, however, was able to point to a sizable hardware manufacturing business and to claim a directly competitive relationship with Apple. Despite zero enforceable injunctions in place against Apple and Microsoft, Motorola Mobility hasn't brought a new patent assertion against these players in years. It raised some new remedies issues over previously-asserted patents in Germany, but I'm not aware of any new filings involving new patents, calling into question whether there is any useful ammunition left in that portfolio. Google has continued and will continue to buy patents, and it's now filing large numbers of patent applications itself. Motorola Mobility's patents were costly, but not that costly. When Google paid $12.5 billion, it got a company that had cash in the bank, accumulated losses that helped Google save taxes, and it has now divested Motorola Mobility's two hardware business lines for roughly $3 billion each. So the patents were costly on the face of it, but didn't hurt Google's bottom line by virtue of advanced financial engineering. The biggest financial issue was the impact of that business on Google's margins. "Quinn Emanuel shall reimburse Apple, Nokia, and their counsel for any and all costs and fees incurred in litigating this motion and the discovery associated with it, as required by Rule 37 in the absence of 'substantial justification' or other showing of 'harmlessness,' neither of which the court finds here. That expense, in addition to the public findings of wrongdoing, is, in the court's opinion, sufficient both to remedy Apple and Nokia's harm and to discourage similar conduct in the future." In other words, Samsung itself is not sanctioned -- only the law firm of Quinn Emanuel. Presumably Samsung will pick up those costs. "The vast majority of these are ludicrously overbroad, such as the suggestion that both Samsung and Quinn Emanuel should be banned from any situation in which they might make use of licensing information for the next two years. Although the evidence has shown Quinn Emanuel failed to notify the relevant parties at the relevant times, and that [Samsung in-house lawyer Daniel] Shim made use of the information, there has been insufficient evidence that this failure to notify or misuse ultimately implicated any issue in this or any other litigation or negotiation. By the final hearing on December 9, 2013, this lack of clear evidence was obvious in the tone of the moving parties. Apple and Nokia's allegations had shifted, acknowledging that the evidence of misuse is 'circumstantial,' must overcome facial 'inconsistencies,' and that even they could only characterize it as 'more likely than not' that the information had been used. In short, what began as a chorus of loud and certain accusations had died down to aggressive suppositions and inferences, and without anything more, Quinn Emanuel and Samsung cannot reasonably be subject to more punitive sanctions." This order by Judge Grewal can be appealed to Judge Koh, and then on to the Federal Circuit. Apple and/or Nokia could try to win further-reaching sanctions; Quinn Emanuel can try to avoid the sanctions that were imposed. Samsung has nothing to appeal because it wasn't sanctioned. The order does not clear Samsung of wrongdoing: misuse is not ruled out at all, but Apple and Nokia were unable to prove the worst part of the original allegations. I'm sure Samsung is very happy about this outcome, also with a view to the March 31 California trial. It's not perfect for Samsung's reputation, but Samsung can now (or, at least, after all appeals are exhausted) say that nothing serious was proven, which is why Samsung itself was not even sanctioned. And Quinn Emanuel will also be more than pleased because it achieved its primary goal of defending its client. The efforts Quinn Emanuel made here in defense of Samsung, under extremely difficult and delicate circumstances, will probably have benefits for the firm that exceed the cost of these sanctions (which, I guess, Samsung will pick up anyway). Motions for sanctions are still pending in other jurisdictions, including but not necessarily limited to the ITC and Australia. In light of Judge Grewal's findings, I won't refer to this issue as the "Patentgate scandal" anymore, unless more serious wrongdoings are proven. At the beginning, things looked rather serious, and orders by Judges Koh and Grewal also expressed quite some concern over what (might have) happened. But at this stage, it would be over the top to call this a "scandal" or to liken it to Watergate. Samsung and Quinn Emanuel are innocent until proven guilty. The court didn't conclude that they're entirely innocent, but didn't identify a whole lot of guilt either. On Monday, Ericsson announced a settlement and patent license agreement with Samsung that will apparently generate billions of dollars in licensing fees over the years, starting with an upfront payment of $650 million. In the announcement, Ericsson claimed that the license "illustrates [its] commitment to FRAND principles". But Ericsson is being investigated by the Competition Commission of India in two parallel cases over a couple of issues, one of which is that it uses the selling price of devices as the royalty base even if the relevant wireless industry standards are implemented in chipsets that sell at a fraction of the price of a smartphone or tablet. Let me first explain the dark red arrow on the left side. It relates to patent exhaustion: once Ericsson licenses a particular layer of the value chain (in this case, the Product Brand Owner, i.e., a device maker like Samsung), its patents are exhausted further down the chain: it can't double-dip and assert its patents against the lower layers (mobile network operators, distributors, end users). 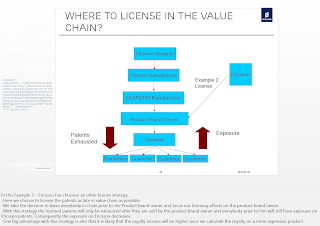 The arrow on the right side, "Exposure", indicates which layers of the value chain could still sue Ericsson without Ericsson being able to use its own patents against them. Let's think of an example: Ericsson now has (again) a patent cross-license agreement in place with Samsung. Samsung's customers are, therefore, licensed. If any of them sues Ericsson, Ericsson can't sued them with respect to their distribution or use of Samsung phones. But if, for example, Qualcomm (a chipset maker) sued Ericsson, Ericsson could still leverage patents against Qualcomm. The same applies to OEM/ODM Manufacturers such as Foxconn. That's because patent exhaustion works only downstream, not upstream. "One big advantage with this strategy is also that it is likely that the royalty income will be higher since we calculate the royalty on a more expensive product." That's the "justification" for the royalty base: more money to the patent holder. But this is not an economic justification. There's no reason why Ericsson should get more from Samsung than it would from Qualcomm if a given patent (or set of patents) could also be licensed to the chipset maker. Ericsson asserted not only standard-essential but also various non-essential patents against Samsung, so on the non-SEP side it may claim that it owns technology infringed by, for example, Android. For SEP-only licensing, however, the proper royalty base is the price of a chipset that implements the standard. I haven't blogged in a while about Lodsys and the demand letters it sent to (and lawsuits it filed against) app developers, but it was a topic I covered extensively in 2011, and many app developers have been following my writings since. I just wanted to draw the attention of app developers to an online survey started by the Application Developers Alliance on its DevsBuild.It site: the Lodsys Victim Survey. If you got contacted and/or sued by Lodsys, please do go there and fill out the form. The App Developers Alliance is trying to find out about the scope and scale of Lodsys's trolling activities, and their effort can shed some more light on it. Some major mobile platform companies are among the Alliance's members. I became a member of the App Developers Alliance yesterday because I find some of their services and activities useful from my perspective as an app developer (my project is in its infancy; it's a game and I'll say more about it closer to its launch). I made clear on Google+ that my membership is apolitical in the sense that I don't endorse anyone's political positions or amicus curiae briefs unless and until I explicitly do so. It's really the DevsBuild.It platform and the Alliance's conferences that persuaded me to join. As far as Lodsys is concerned, my disdain for its trolling ways is long-standing and well-documented, which is why I gladly support this particular research effort. This morning Ericsson announced the settlement of its patent dispute with Samsung. The Swedish company also announced that "[t]he initial payment in the agreement will impact Ericsson sales and net income in Q4 2013 by SEK 4.2 b. [$650 million] and SEK 3.3 b. [$500 million]", suggesting that Ericsson will earn billions of dollars over the years. The settlement comes shortly before the initial determinations on the parties' ITC complaints against each other would have been due. Ericsson claims this license deal "illustrates [its] commitment to FRAND principles". The dispute with Ericsson complicated Samsung's assertions of FRAND-pledged standard-essential patents against Apple because Samsung raised some Apple-like arguments in its defense against Ericsson's assertions. At the same time, Ericsson's SEP assertions are being investigated by the Competition Commission of India in two parallel cases. Both Samsung and Ericsson had to put an end to this dispute because any attempt to enforce an ITC import ban over a FRAND-pledged SEP could have had far-reaching implications. Earlier today Samsung and Google announced a cross-license agreement covering all of their current patents and any patents they will obtain over the next ten years. The Ericsson-Samsung settlement is more significant because it settles actual litigation pending before the ITC and the United States District Court for the Eastern District of Texas, because these companies aren't allies, and because serious money is changing hands. Ericsson will receive additional patent royalties from Samsung whenever the latter settles its dispute with the Rockstar Consortium, which Huawei (one of the companies sued by Rockstar) just did. Ericsson is one of Rockstar's owners. Late on Sunday, Samsung and Google announced a ten-year global patent license agreement. As the announcement notes, they already have a "long-term cooperative partnership" in place, so there was no immediate threat of litigation between them anyway. The press release quotes IP executives from both companies who suggest that this agreement should serve as a model for the wider industry, as an alternative to patent litigation. Those quotes show that the intention here is primarily to make those look bad who enforce their patents. Samsung is embroiled in disputes with Apple and Ericsson, and Google's Motorola Mobility with Apple and Microsoft. But Apple also struck a ten-year license deal with HTC in late 2012, one of 23 announced or publicly-discoverable royalty-bearing Android patent license agreements (most of which relate to Microsoft's patents). Recently Samsung and Nokia announced an extension of a license deal as well, and it may also cover Android but the scope was not specified. In other words, the fact that Google and Samsung enter into a long-term cross-license agreement does not make them IP innovators or thought leaders. Samsung and Google own a lot of patents, but they haven't been able to gain much leverage from those patents against Apple, Microsoft and others. They have, however, lost a number of lawsuits, and just last week a U.S. judge found Samsung to fringe yet another Apple patent and invalidated one of Samsung's patents-in-suit, ahead of a trial scheduled to start on March 31. One way to sum up the announcement would be this: "If you can't beat 'em, just try to make 'em look bad". It's not just about making the enforcers look bad but also about giving the impression of being willing licensees. Prior to this announcement, the last Google patent license agreement with another major industry player that was announced was a deal with Yahoo that cleared the path for Google's IPO about a decade ago. There could also be antitrust considerations. Both companies face antitrust investigations because of their assertions of standard-essential patents. They both rely largely on the same law firm in that context and make similar royalty demands (Samsung is known to demand 2.4% of Apple's sales, while Motorola Mobility wants 2.25%). Through this cross-license deal among friends they may hope to somehow validate their supra-FRAND demands in the eyes of regulators, but I believe competition enforcers won't be overly impressed. I've been somewhat skeptical of the prospects of a near-term Apple-Samsung settlement for some time (see my comments to the Korea Times). I'm now even more skeptical because I believe Samsung would rather announce the really big news of a deal with Apple than engage in a PR ploy with a close ally. As long as Samsung primarily makes Android-based devices, it doesn't need a deal with Google, or vice versa, to avoid litigation between the two. If Samsung switched to an alternative platform like Tizen, then the agreement might make a difference, but since the scope was not announced, it's possible that Google reserved the right to sue Samsung over non-Android devices. While the United States Court of Appeals for the Federal Circuit gave every indication at a December hearing that the grossly erroneous non-copyrightability holding in Oracle v. Google will be reversed, it's simply not possible to predict whether the appeals court will resolve (through judgment as a matter of law) or remand (with the potential need for another jury trial) Google's "fair use" defense. I really believe the Federal Circuit has all the facts in the case record that it can enter JMOL because no reasonable jury (and that 2012 jury simply wasn't reasonable, except for its smart foreman) could have found otherwise. But appeals courts tend to defer to juries on a lot of things even if they disagree with a jury's conclusions. So we don't know. With a view to the upcoming ruling I'd like to talk a little more now about the concept of fair use and its reasonable boundaries. In May 2012 I already stated in no uncertain terms that I didn't buy Google's "fair use" defense in the Android-Java case. Nothing has changed about that assessment, nor is there a need to reiterate that position. I would, however, like to look at it from a different angle this time around. The highest-profile pending case centered around fair use (while Oracle v. Google is also very high-profile, the make-it-or-break-it question of the appeal was copyrightability) is the "Google Books" case, The Authors Guild, Inc., et al., v. Google Inc., which was dismissed on November 14, 2013 by United States Circuit Judge Denny Chin, sitting by designation on the United States District Court for the Southern District of New York. After the United States Court of Appeals for the Second Circuit had remanded the case to the Southern District of New York with the instruction to adjudicate the fair use defense first (Second Circuit opinion, commentary by Professor Grimmelmann), Circuit Judge Chin -- acting as a district judge -- entered summary judgment in Google's favor on the basis of fair use (summary judgment ruling). I'm in favor of reasonably strong copyright, and I wrote a dozen books (most of them while in high school). So I used to be somewhat sympathetic to the cause of the Authors Guild, especially since my own experience in using Google Books was that I was amazed at the amount of third-party content it provides for free and on an unlicensed basis. But having looked at the case in more detail (with a view to the further proceedings in Oracle v. Google), I now tend to agree largely -- apart from some nuances -- with Circuit Judge Chin's summary judgment ruling, for reasons that relate to the fundamental difference between the parameters of the Google Books case on the one hand and the Android-Java case on the other hand. "The central purpose of this investigation is to see, in Justice Story's words, whether the new work merely 'supersede[s] the objects' of the original creation, Folsom v. Marsh, supra, at 348; accord, Harper & Row, supra, at 562 ('supplanting' the original), or instead adds something new, with a further purpose or different character, altering the first with new expression, meaning, or message; it asks, in other words, whether and to what extent the new work is 'transformative.' Leval 1111. Although such transformative use is not absolutely necessary for a finding of fair use, Sony, supra, at 455, n. 40, the goal of copyright, to promote science and the arts, is generally furthered by the creation of transformative works. Such works thus lie at the heart of the fair use doctrine's guarantee of breathing space within the confines of copyright, see, e. g., Sony, supra, at 478–480 (Blackmun, J., dissenting), and the more transformative the new work, the less will be the significance of other factors, like commercialism, that may weigh against a finding of fair use." I prefer transformation of the kind that is very distinct from copying, but I also understand that technological progress may in some contexts justify types of use that are less creative than, for example, a parody. Google has clearly been pushing the envelope in terms of deriving benefits from § 107 (1) through technology-centric rather than content-centric interpretations of the first factor. In the thumbnail images context, I'm definitely in favor: it's the only way to make image search work. On Google Books, I also come down on Google's side, though not without some reservations remaining. It's true that Google Books "uses snippets of text to act as pointers directing users to a broad selection of books" and that it enables "substantive research, including data mining and text mining in new areas, thereby opening up new fields of research" (for example, the decision mentions that "researchers can track the frequency of references to the United States as a single entity ('the United States is') versus references to the United States in the plural ("the United States are") and how that usage has changed over time". I wouldn't necessarily call it "highly transformative" and, as a user, felt that the "snippets" Google makes available are rather long considering that this is unlicensed use (by the way, Circuit Judge Chin concluded that the third factor "weights slightly against a finding of fair use", sharing my concern even if not to the same degree). That said, I'm glad that Google Books exists. Google's defense of innovative business models has in some areas done the world a great service and I applaud it. But too much of a good thing can be a total disaster, and Google's positions on Android's use of Java are far outside the scope of any reasonable definition of fair use. In Java's case, since it was already available for mobile devices, it wasn't really "transformative" to make it available on an unlicensed basis in yet another mobile platform. This is closely related to the fourth fair use factor, the effect of the use in question on the potential market for or value of the copyrighted work. Circuit Judge Chin noted that "Google does not sell its scans, and the scans do not replace the books". It takes only this one sentence to distinguish the Google Books case from the Android-Java case. While Google may not "sell" Android in the most straightforward sense, it uses it directly for the generation of revenues, as opposed to the snippets displayed by Google Books, which are advertising-free. Also, it appears that Google does actually charge license fees for certain Android components. But the most important part is that "the [Google Books] scans do not replace the books", and Circuit Judge Chin takes it even further where he concludes that "a reasonable factfinder could only find that Google Books enhances the sales of books to the benefit of copyright holders". Android, however, did replace -- actually, displace -- Java on mobile devices. And while Circuit Judge Chin determined that a reasonable jury couldn't identify anything other than a bottom-line benefit to copyright holders, District Judge William Alsup found in 2011 that "[o]n the present record, a reasonable fact finder could disagree with Google's rosy depiction of Android's impact on the Java market". Google Books points potential customers to shops like Amazon where they can buy the full books. There's nothing like that in the Android-Java context. No end user will buy a Mobile Java phone (or tablet) after buying an Android phone (or tablet) because of a promotional or whatever other, even indirect, effect. Things haven't been going too well for Google in the patent litigation arena recently. And there's potential for further bad news as an Intellectual Ventures v. Motorola Mobility trial started in Delaware on Tuesday and the Federal Circuit is likely to issue its ruling on the "Posner appeal" (which will most likely result in a remand requiring Motorola to defend itself against the "Steve Jobs patent" and other Apple patents) soon, given that the appellate hearing was held four months ago. And while not a verdict or ruling, it's also bad news for Google that Huawei settled with the Rockstar Consortium. On Tuesday, non-practicing entity SimpleAir announced a verdict that was rendered in the Eastern District of Texas on Saturday. Google was found to infringe U.S. Patent No. 7,035,914 on a "system and method for transmission of data" with its Google Cloud Messaging (GCM) and Android Cloud to Device Messaging (C2DM) services. I don't view a broad patent like the SimpleAir '914 patent as beneficial to innovation, but the irony in this is that Google's Motorola (before and after the acquisition) also enforced a synchronization patent against Apple's iCloud push messaging. Apparently Google now has to fend off a damages claim by SimpleAir amounting to well over $100 million. On Tuesday, Judge Koh found Samsung's Android-based devices to infringe an Apple auto-correct patent. If Samsung infringes, so do other Android device makers. On Wednesday, a federal judge in the Eastern District of Virginia determined that even after a modification that was meant to be a workaround, Google's AdWords offering still infringes on a Vringo patent. As a result, Vringo can collect additional royalties. The "colorable difference" standard applied here is also used in connection with U.S. patent injunctions. Google will now to either keep paying royalties to Vringo or it will have to come up with a workaround that the court will clear. At the moment Google appears to be on a losing streak in U.S. patent courts, and as I said further above, more bad news is probably coming in the near term. Google's patent infringement issues are definitely a key reason for its push for patent reform legislation, and I doubt that Congress will solve Google's problems anytime soon. There will either be a quick agreement between both chambers of Congress on a targeted and limited reform bill or things will take much longer. While the motion to dismiss does not explicitly state that the parties have settled, it would be utterly unrealistic to believe that Rockstar would let Huawei use those patents without a royalty-bearing license. Whatever the basis of this settlement may be, a "freebie" it's certainly not. This is already the second time over the last couple of months that Huawei has become the first defendant to settle litigation targeting multiple companies. Huawei also reached an agreement recently with standard-essential patent (SEP) troll InterDigital to resolve the dispute through arbitration of the royalty fee. It's possible that the settlement with Rockstar also involves arbitration of license fees, but the parties may already have agreed on financial terms. The remaining defendants, besides Google, are Samsung, ZTE, LG, HTC, Pantech, and ASUSTeK. Google is trying to get those lawsuits transferred out of the Eastern District of Texas to the Northern District of California. The Huawei settlement is a problem for the remaining defendants because it suggests to the court and possibly one day to a jury (or multiple juries) that Rockstar's infringement allegations have merit. It increases the likelihood of other "defections" from the Google-led defensive alliance. There are probably numerous other Android patent license deals in place that just weren't announced. In a summary judgment order entered late on Tuesday (January 21, 2014), Judge Lucy Koh, the federal judge presiding over two Apple v. Samsung patent cases in the Northern District of California, found Samsung's Android-based devices to infringe an Apple patent on word recommendations (autocomplete) and declared a Samsung patent on multimedia synchronization invalid. Judge Koh denied a couple of other summary judgment requests by Apple and the entirety of Samsung's related motion, leaving those issues to a federal jury. This decision increases, not hugely but significantly, the likelihood of Apple emerging victorious in a multi-patent trial scheduled to begin on March 31, 2014. Prior to this ruling, Apple and Samsung were asserting five patents each in this two-way patent spat that started in 2012, roughly a year after the worldwide dispute between the two market leaders broke out in the same district (it subsequently turned out into a global battle with filings in ten or more countries). After the summary judgment decision, Apple still has five patents in play, one of which has just been found infringed (leaving to the jury only Samsung's invalidity defense), while Samsung is down to four patents. The outcome of the new summary judgment ruling is reminiscent of what happened ahead of the summer 2012 California trial between these companies. At the same stage of that litigation, all of Samsung's summary judgment requests were denied as well, while Apple was cleared of infringement of one of Samsung's patents. This time around the outcome is even better for Apple because it now holds an infringement finding in its hand and merely has to defend the validity of the autocomplete patent at the spring trial. A graphical user interface on a portable electronic device with a keyboard and a touch screen display, comprising: a first area of the touch screen display that displays a current character string being input by a user with the keyboard; and a second area of the touch screen display separate from the first area that displays the current character string or a portion thereof and a suggested replacement character string for the current character string; wherein; the current character string in the first area is replaced with the suggested replacement character string if the user activates a key on the keyboard associated with a delimiter; the current character string in the first area is replaced with the suggested replacement character string if the user performs a gesture on the suggested replacement character string in the second area; and the current character string in the first area is kept if the user performs a gesture in the second area on the current character string or the portion thereof displayed in the second area. The Samsung patent the judge tossed is U.S. Patent No. 7,577,757 on a "multimedia synchronization method and device". Samsung was asserting three claims from this patent. Apple successfully argued that this patent should not have been granted in light of an earlier-filed one, U.S. Patent No. 7,587,446 on "acquisition and synchronization of digital media to a personal information space". Samsung had acquired the '757 patent in September 2011 -- five months after the patent dispute with Apple started, suggesting that the primary motivation was to leverage it in an offensive counterclaim (particularly those over non-standard-essential patents) against Apple. The fact that Apple is on the winning track again will likely affect the companies' negotiating positions and tactics when their CEOs meet for settlement talks within four weeks. In order to have signficant leverage, Samsung would need to bring more to the table than a few findings of infringement of standard-essential patents encumbered by FRAND licensing obligations. Samsung has not prevailed on a single non-SEP claim against Apple after almost three years of Earth-spinning litigation, and the latest summary judgment ruling again calls into the question the merits of Samsung's allegations that Apple, too, infringed (the use of SEPs through the implementation of industry standards is not really a violation as long as Samsung does not make a cash-only offer on FRAND terms). The strategically most important issue complicating a settlement is a conditio sine qua non: Apple will only sign a license agreement if it contains restrictions to the scope of the license including, in particular, an anti-cloning provision. This stance was clarified again last week in a court filing. On Thursday (January 23, 2014), the Oberlandesgericht München (Munich Higher Regional Court) originally planned to hold a hearing in an Apple v. Motorola Mobility case over the European version of the famous "rubber-banding" (overscroll bounce) patent, EP2126678 on "list scrolling and document translation, scaling, and rotation on a touch-screen display". In September 2012, the Munich I Regional Court ordered an injunction against Google subsidiary Motorola Mobility's devices over this patent. Presumably the Moto X, which will become available in Germany soon, does not have this iconic feature. Today I found out that the Munich appeals court has vacated the Thursday hearing (technically, these are two hearings: one lawsuit targets Motorola Mobility, the U.S. company, and the other one the German subsidiary). The court prefers to await further developments in an opposition (reeexamination) procedure pending before the European Patent Office (EPO), in which Motorola Mobility and Samsung are challenging the validity of this patent. Apple also asserted this patent against Samsung -- not only in Germany, where the Mannheim Regional Court identified an infringement but stayed the case pending the EPO opposition proceeding, but also in other jurisdictions. Apple prevailed on this patent in Japan last year and, the year before, a federal jury in the Northern District of California deemed it valid and infringed. An injunction hearing will be held in San Jose on January 30 over this patent and two other multi-touch software patents. The United States Patent and Trademark Office (USPTO) terminated a reexamination proceeding last year and confirmed several claims, including the one at issue in the California Apple v. Samsung case. The outcome of the European proceeding could be different due to the "technicity" requirement under European patent law, which is, however, interpreted less rigidly by the EPO (which views patent filers as customers whose demands for monopoly rights it has to meet) than, for example, the Federal Patent Court of Germany. The appeals court's decision to wait until there is further news from the EPO (at which point either party will be free to request that the court set a new hearing date) makes sense considering that Google's Motorola had hardly any non-infringement defense: the whole case hinges on validity. Apple has an injunction in place (I don't know whether it's enforcing it, but it may very well be). In that regard, it has nothing to gain from this appeal being resolved ahead of the EPO proceeding. At some point it will also seek damages for past infringement, but I guess it has no problem with doing so at a later stage. Google would like to get the injunction lifted, but this would probably not have happened even if the appellate proceedings had been stayed: in Germany, it's easier to get the appellate proceedings stayed over doubts concerning validity than to get an injunction lifted, as Apple experienced in the push notification case. When the CEOs of Apple and Samsung, accompanied by several in-house lawyers, meet for their (court-requested) settlement negotiations on or before February 19, there will probably be flexibility on both sides relating to the billions of dollars in license fees that may change hands, but if Samsung wants a deal, it will have to accept, as HTC did before it, an anti-cloning provision that would allow Apple to still bring lawsuits if Samsung's products resembled Apple's offerings too closely in ways that could actually be avoided by means of designarounds. Yes, this may very well be a dealbreaker and require these parties to square off at the trial in their second California litigation, which is scheduled to begin on March 31. But no matter how much Samsung may hate the notion of an anti-cloning provision (it's definitely at odds with the strategy that enabled Samsung to become the global market leader in smartphones), it's s safe assumption that a deal will only come into being if Samsung accepts this. In a sworn declaration of January 16, 2014, Apple's BJ Watrous, Vice President and Chief Intellectual Property Counsel, told the United States District Court for the Northern District of California that Apple's "discussions with Samsung have consistently included limits to both the scope of any license and a prohibition against cloning Apple products." On that basis, Apple's lawyers wrote on the same day: "Samsung incorrectly claims [in its opposition to Apple's motion] that Apple made recent offers to Samsung without anti-cloning provisions. Every offer Apple made to Samsung has included limits to both the scope of any license and a prohibition against cloning Apple products." This topic could come up again at the January 30 injunction hearing before Judge Lucy Koh. It's relevant because a willingness to license patents can weigh against a patentee's pursuit of injunctive relief. Apple argues that Samsung's infringement of three multi-touch software patents must come to an end. Samsung, obviously, opposes this. It brought a motion (which was denied) to conduct some discovery relating to more recent settlement negotiations. Apart from clarifying Apple's position on an "anti-cloning provision", Apple's reply brief just reinforces the points it made in its original motion. I'm slightly disappointed that Apple opposes Samsung's request that the court stay any injunction (if one issues, which is what I expect to happen) with respect to the '915 pinch-to-zoom API patent, which the United States Patent and Trademark Office has rejected for the time being (an appeal within the USPTO is underway and, as Apple's brief notes, the examiner could acquire control over the matter again). I think it's legitimate for Apple to pursue an injunction, but I don't think it's appropriate to enforce this patent until the USPTO possibly (if ever) changes its position and views the patent more favorably than it does now. I do, however, agree with Apple that Samsung's request for a stay reveals a lack of confidence in its alleged designarounds: "If Samsung is confident that its design-arounds do not infringe the '915 patent, then enforcement of the injunction poses no threat to Samsung." On Thursday (January 16, 2014), the Competition Commission of India decided to launch a second antitrust investigation of Ericsson's assertions of FRAND-pledged standard-essential patents (SEPs). This time around, the complainant is Intex Technologies, a local hardware company. The first investigation of Ericsson's SEP-related conduct started in November further to a complaint by another local device maker, Micromax. "Ericsson also required [Intex] to enter into an NDA [non-disclosure agreement] as a necessary pre-condition for letting [Intex] know about the details of the alleged infringement. [Intex] also stated that despite several objections and reservations, it was compelled to sign the NDA before Ericsson provided details of infringement to [Intex]." "The NDA prevents [Intex] from disclosing any proprietary confidential information of Ericsson to the Informant's vendors. As a result, the Informant cannot even discuss with its vendors, regarding the alleged infringements, of Ericsson's patents for the products supplied by them despite the fact that the Informant had specific agreements in place with such vendors wherein the vendors have represented that the products of the vendor do not infringe any of the intellectual property rights of third parties. Further, the NDA provides for jurisdiction of Singapore and cripples [Intex's rights] to address or seek redress of its grievances in a local court of law." At this stage, the CCI merely stated what Intex had told it in its complaint. If any of the above is true (which I don't doubt, though I haven't seen any proof of it either), it does raise issues in and of itself. SEP holders should have to provide infringement claim charts without an NDA. If anyone's confidential business information is at stake in this context, it's the alleged infringer, if (and only if) confidential technical aspects of its products are addressed by a claim chart. But if a patent is public and a SEP holder believes it's infringed merely by implementing the standard, then there's no reason why an infringement theory (particularly if based on the specifications of the standard, which is typically public, too) should be withheld unless an NDA is signed. The second paragraph quoted above may explain why Ericsson primarily imposed such restrictions on Intex: it wanted to complicate the alleged infringer's discussion and coordination with chipset makers affected by Ericsson's assertions. Should this be the case, I would also regard it as anticompetitive. If Ericsson insisted on a foreign jurisdiction (Singapore), that would be another problem -- not because it's Singapore, but because it's not India, where Intex is based and presumably sells the bulk of its allegedly-infringing products. SEP-related issues should be sorted out in a jurisdiction with respect to which a patent holder seeks royalties. If companies reach an agreement without undue pressure or threats, there's no problem with a worldwide NDA or even a worldwide license agreement under one particular country's jurisdiction. But if any FRAND licensing issues come up, they must be resolved locally. Otherwise there's a risk of companies availing themselves of foreign jurisdictions (and the leverage they have in foreign markets with patents) with the effect of distorting competition (through hold-up) in the local market. This, too, is something I believe other antitrust enforcers should keep an eye on (for example, in connection with InterDigital). I expect further developments in the FRAND antitrust arena in the weeks and months ahead. For example, the European Commission indicated last month that Samsung's proposed settlement offer may need improvement. It will be interesting to see whether the EU's top competition authority will expect Samsung to address the very fundamental shortcomings of its proposal or content itself with cosmetic, face-saving changes. In other FRAND news, U.S. cable network operator Charter Communications filed a lawsuit in the District of Delaware this month against the Rockstar Consortium (owner of thousands of ex-Nortel patents acquired in a 2011 auction), one of its subsidiaries, and Spherix, a patent monetizer to which Rockstar recently sold 100 patents. Charter raises a variety of issues and wants the court to require the defendants to make a FRAND offer (a "specific performance" remedy). Its allegations include, among other things, the claim that Rockstar assigned FRAND-pledged patents to other entities without ensuring that those would honor Nortel's original FRAND licensing commitments. It's too early to tell whether Google and Samsung (two companies whose SEP assertions have given rise to antitrust investigations in different jurisdictions) will discuss similar issues in connection with their dispute(s) with Rockstar. Google has answered to the Rockstar/Netstar search engine patents complaint, emphasizing an inequitable-conduct defense, and is now also a co-defendant in a lawsuit against Samsung. While Google generally favors aggressive SEP enforcement, it did semi-surprisingly raise a low-key FRAND defense against Intellectual Ventures (over former Nokia patents) last year.